Before you get started learning about Python algorithm development, make sure you go through our Getting Started Guide to learn how to create your first algorithm, understand permissions available, versioning, using the CLI, and more. We’ll continue to add variants as needed, and broaden GPU support. You can utilize common Python libraries such as Scikit-learn, Tensorflow, Numpy and many others by adding them as a dependency in your algorithm. Also, algorithms can call other algorithms and manage data on the Algorithmia platform. To find out more via the Algorithmia Python Client. 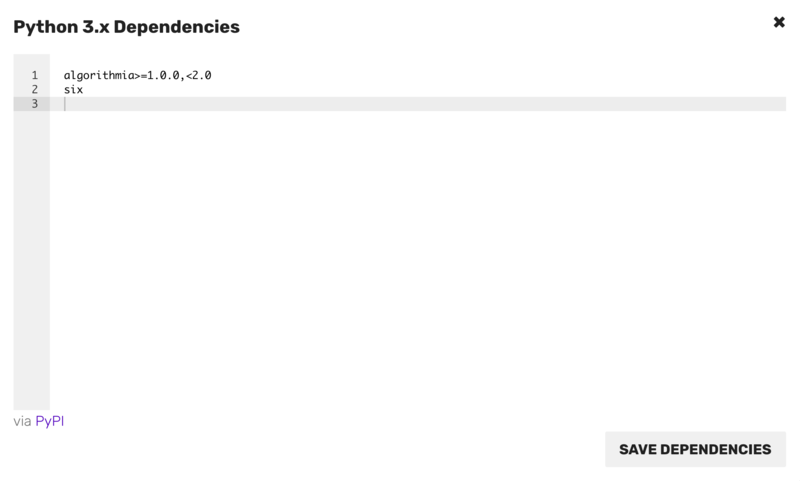 Algorithmia supports adding 3rd party dependencies via the Python Package Index (PyPI) using a requirements.txt file. If you have any dependencies you can add them by typing in the package name to the requirements.txt file. If you do add dependencies, you will still need to import those packages via the import statement to your algorithm file as you would do for any Python script. If you’re using Python 3, the syntax has changed for imports. You’ll need to use: from .somefile import * instead of in Python 2 where it’s from file import *. The first algorithm that we’ll create will take a JSON formatted object passed as input by the user which is deserialized into a Python dictionary before the algorithm is called. It will output a JSON formatted object which the user will consume with an API call to the algorithm path. """Finds the minimum and maximum numbers in a list.""" # Check for numbers field and make sure it contains a list. # Get the value of the field "numbers"
"""Take a user file holding text content and returns text split into words.""" # Check if the file exists in the user specified data collection. # Return dictionary of original text and the sentences broken up into their separate words. The code above with return both the original text and the list of each sentence split up into words. To call other algorithms or manage data from your algorithm, use the Algorithmia Python Client which is automatically available to any algorithm you create on the Algorithmia platform. For more detailed information on how to work with data see the Data API docs. """Call algorithm that returns main text content from a URL.""" """Take user input of URL and return text split up as words.""" Putting everything in one source file sometimes doesn’t make sense and makes stuff hard to maintain, many times you’ll want to break your code into multiple source files. Importing your secondary files contains some ceavats when executing your algorithm on Algorithmia, in particular the import paths you use locally may vary from ours.